It’s Thirsty Thursday!!! You know what that means.. Its time to start relaxing as the weekend is only one more sleep away! So why not sit back tonight, with your feet up & enjoy you favorite drink after work… my favorite being the Ceasar! I feel as though we can come by it honestly as the Ceasar was invented in Alberta. It’s basically a hometown drink! Back in 1969, Walter Chell, a bartender in Calgary, AB, was asked to concoct a drink for the opening of a new Italian restaurant. Together in a glass he mashed up clams, added tomato juice, vodka, Tobasco sauce, Worcestershire & salt & pepper. He garnished it with a celery stick … he named it for the Roman Emperor.. “Bloody Ceasar”. 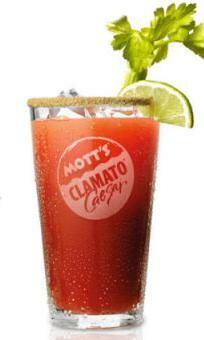 Since then Mott’s worked with him to develop Clamato juice! Who would have ever thought those ingredients would make such a delicious drink. Its a VERY rare site to see my pantry without 4 bottles of Clamato, an extra bottle of Tobasco & Worcestershire Sauce.. & a 40 oz of Vodka.. Sounds bad I know.. but ceasar drinkers get cravings & those cravings need to be fulfilled. Since then every place or person has developed their own style of Ceasar.. You can add horseradish, Franks Red Hot Sauce, Pickled Beans or Asparagus or Carrots, Bacon strips, pepperoni.. heck why not make a salad in your ceasar. One of my favorites is jalapeno stuffed olives, or peppers! Also we always add a dash of lime juice. It may sound easy to get this recipe right, but there is nothing worse then a BAD ceasar & trust me folks this happens more then not. There you have it!The Worlds Best Ceasar! Hope you can all go home now after work & unwind with this tasty drink. Now I am even more confident in our housewarming gift of a ceasar kit to you two! So… since its no longer Thirsty Thursday.. how about happy hour at my place after work… maybe Funtimes Friday? !